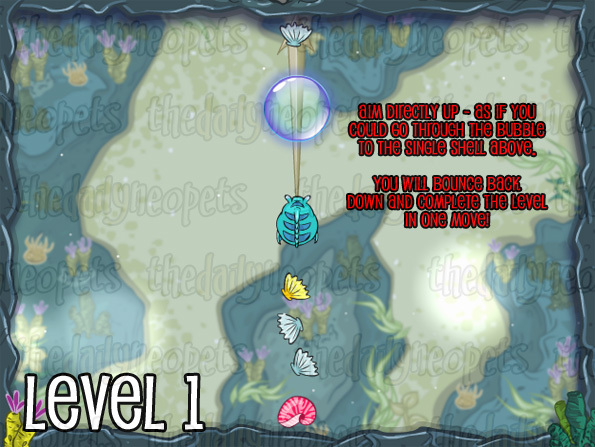 In Petpet Plunge, you collect sunken treasures throughout twelve levels. 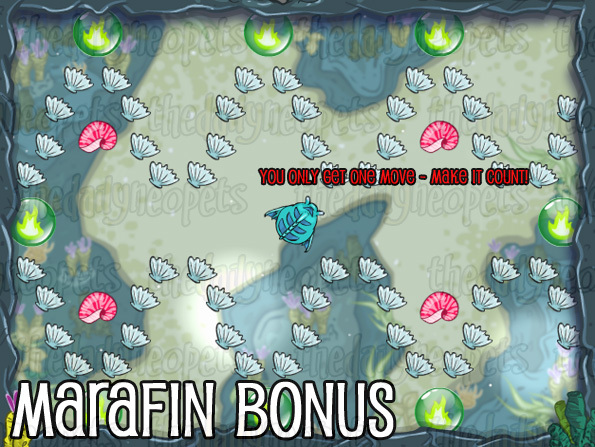 You don't have to get wet - you have Maraquan Petpets willing to help! Point them in the right direction and they will do the rest for you! You use your mouse in this game. No keyboard! To move your Petpet, click on the petpet and hold down the mouse while dragging in the direction you wish to go. The further away you take your mouse from the Petpet, the bigger the arrow. The arrow size determines how far your Petpet will go - a small arrow equals a small plunge, and a larger arrow will take your Petpet further. 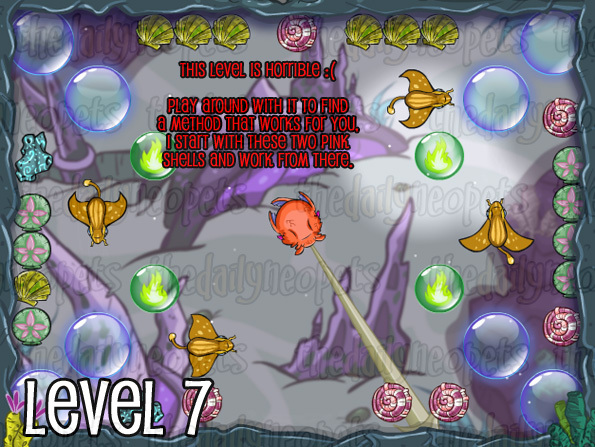 To complete each level you have to collect every item. They are scattered across the screen either in groups or alone. 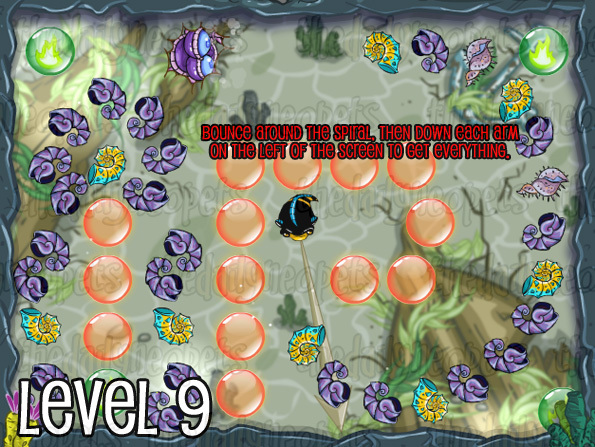 You will want to try to plan your moves though - you only get four shots per level. If after your four shots you haven't collected everything, it's game over! Some of the items have helpful properties when you pick them up too. For example, when you collect the piece of Marachite your Petpet becomes immune to friction! 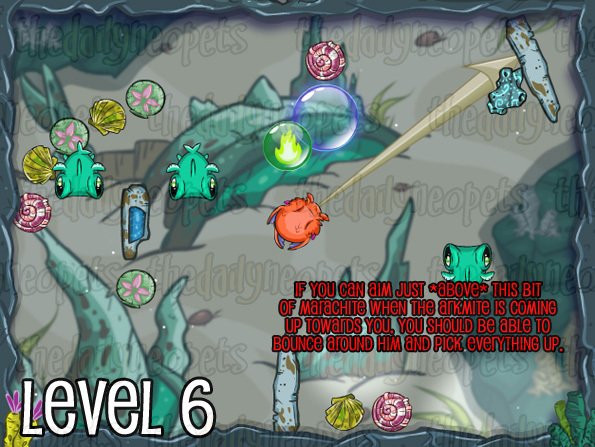 This means you won't slow down at all as your shot starts to run out of juice :) Several of the coloured shells have speed inducing powers too so you want to collect those to boost your shot! It's easy enough to point in the direction you want to go, but to make it a bit more of a challenge there are bumpers and obstacles for you to work around. 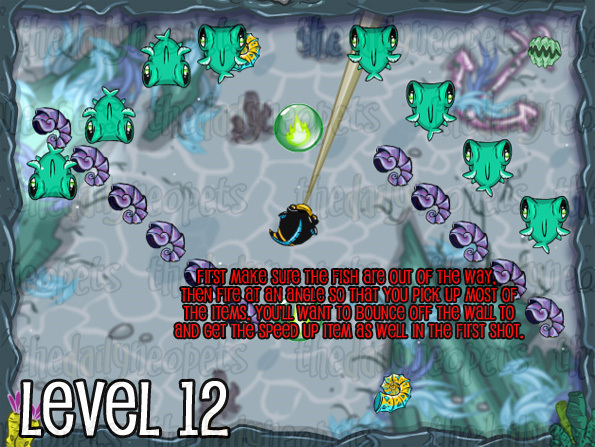 Bumpers are the colourful bubbles that show up in every level and can be blue, green or orange. These can be helpful. Bouncing off a blue bumper once will burst the bubble. Now you can move through that area without having to worry about the bubble being in the way! Green bumpers take three bounces to burst and orange bumpers don't burst at all. But, like I said, they can be helpful. 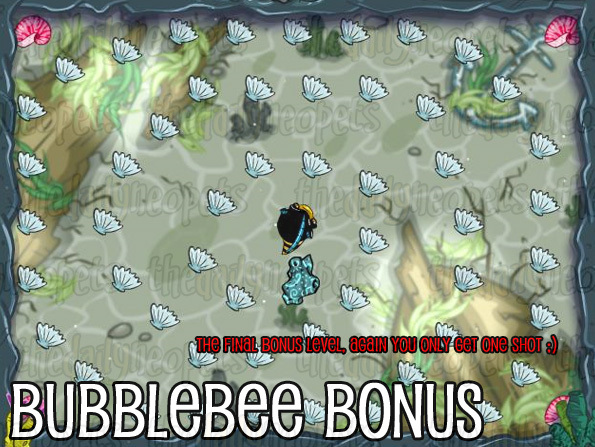 Green bubbles will speed you up when you hit one, and you can bounce off any of them and end up collecting items you didn't expect. Or they could send you in a direction you didn't really want to go. With a bit of practice you can position your shot to bounce off a bubble in the direction you want. 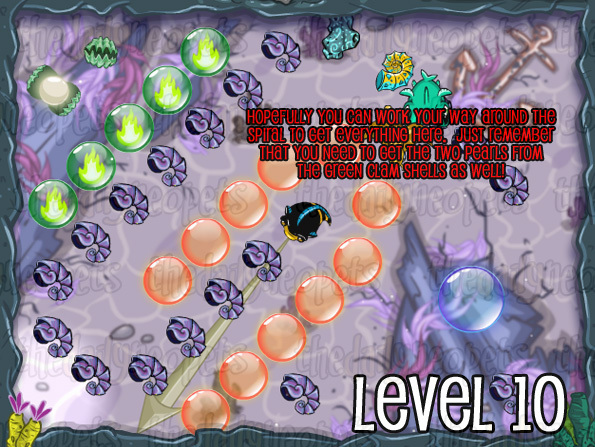 Obstacles are three types of Petpet - Arkmite, Ghoti and Darpinch. These won't show up in the game until level five, and they swim around the levels slowly, often near items you need to collect. Wait for them to pass, remember, there's no time limit. It you hit one you won't lose a life, but it will usually change direction (and so will you!). 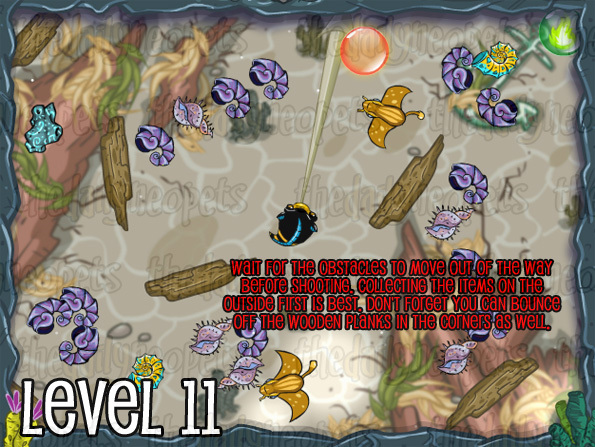 Once you get to level ten, you'll also come across green clam shells which contain a pearl. 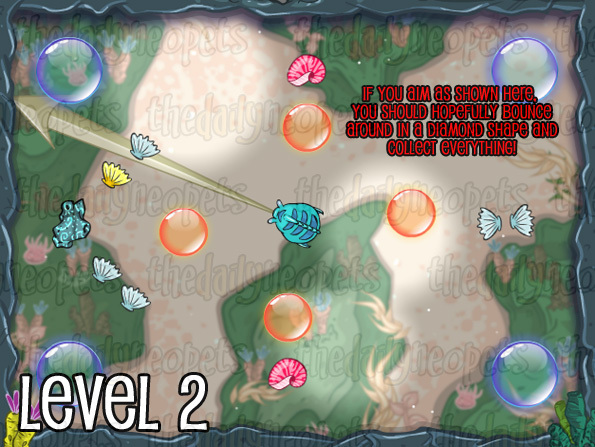 These pearls will grant you an extra shot once you collect them - which in the later levels is essential! The clams need to be open when you pass over them, otherwise the pearl is protected and you can't pick it up. 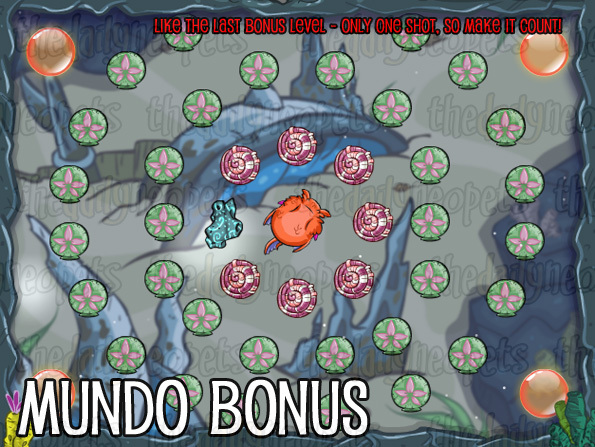 Finally when you complete a level in one shot, you will come across whirlpools. 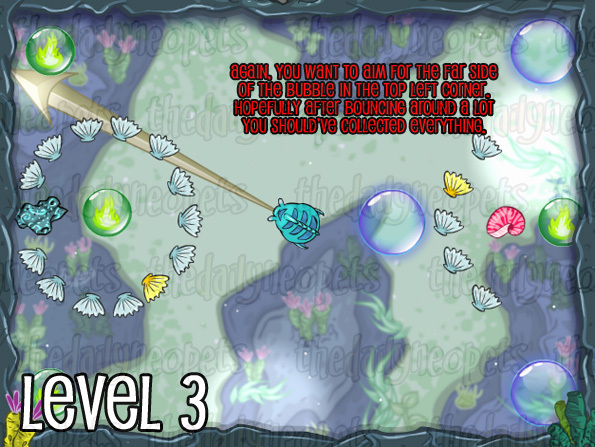 There are three whirlpools throughout the game and they appear when you burst a blue bubble in the correct level. 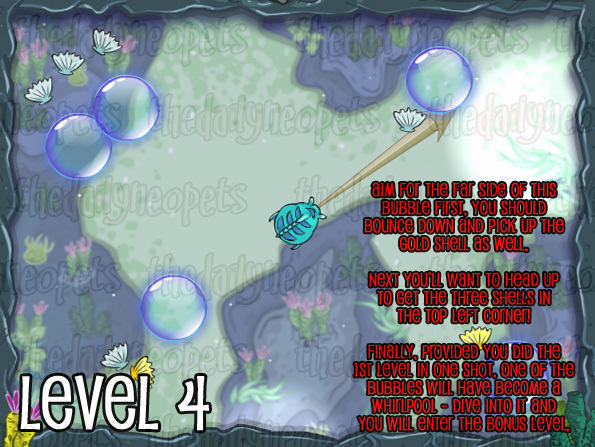 It works this way - if you compete levels one, two or three in one shot, then level four will have a whirlpool. 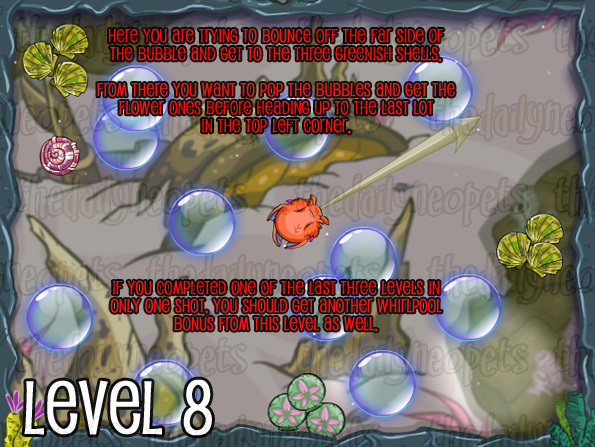 And if you complete levels five, six or seven in one shot, level eight will have a whirlpool! These are good. You won't be drawn in so you have to make your own way over to them. 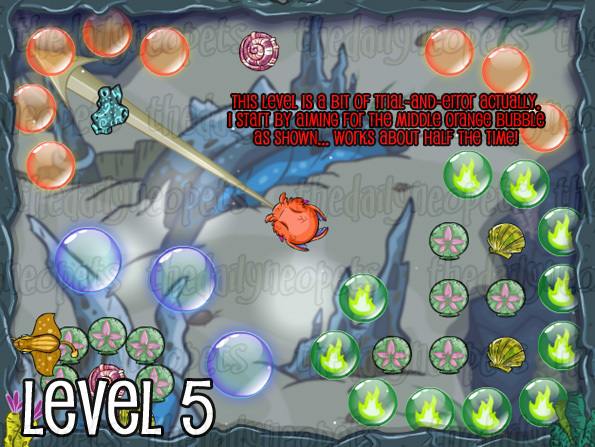 These take you to bonus levels which give you one shot to try to get everything. There are LOTS of items to collect in one shot so plan it carefully!